Blue Marlin is the largest and most exciting gamefish that can be caught in Tobago's waters. In May of 2013 a Blue Marlin weighing 1,005.9 pounds was caught during the Tobago International Game Fishing Tournament by angler Brendon Bernard aboard the boat Predator. Catches of fish over 600 pounds are regularly recorded in these waters. These large predators can battle anglers for several hours with runs sometimes in excess of 800 meters in a few seconds. They are considered by anglers world over as the King of all gamefish for their extremely strong fighting ability and aerial acrobatic displays. Around Tobago, Blue Marlin can be caught throughout the year, however, they are more abundant from October through June with the peak period being February through May. Catch and release. Sailfish are a regular catch during the months of October through May around Tobago. They are fast and acrobatic swimmers. They provide anglers with a very exciting battle, high speed tail walks with areal leaps and reel screaming runs in excess of 300 meters. Sailfish quite often travel in shoals and multiple strikes and hook ups are not unusual. Light tackle in the 20 to 30 pound line class is the preferred angling equipment to catch Sailfish on. 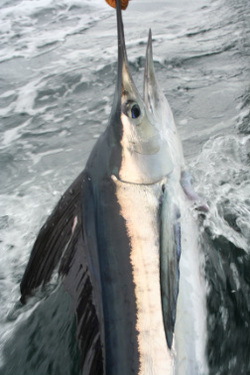 White Marlin are considered the most acrobatic of all billfish. Though they are a rare catch in Tobago's waters they do show up from time to time during the offshore season with the best months being November through May. This is a very exciting gamefish particularly on lighter tackle. A very fast swimmer that can jump clear out of the water time and time again during the battle. Spearfish are the rarest of all billfish species worldwide. The Long bill spearfish is an Atlantic specie that can sometimes be caught around Tobago. Fortuneately for us at Hard Play fishing we have been successfull in catching all of the Atlantic Billfish species including this Spearfish which was photographed and released aboard Hard Play II in 2010. Catch and release. Swordfish can be caught around Tobago all year round, however, October through April are the best months to target these Gladiators of the sea. Mostly we fish for Swordies at night, however, day time deep dropping works just as well. Swordies are very tough fighters and should be handled with caution when bringing a live one to the boat. Great eating fish, however, Swordfish should be targeted responsibly and not over fished. Hard Play Fantasy Billfish challenge. Any angler that catches all 5 of the above billfish species aboard our boats will receive 1 full day trip aboard the Gold spoon absolutely free. 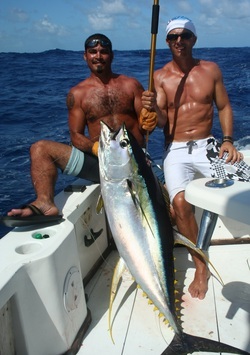 Yellow Fin Tuna travels in large fast moving shoals. They are very strong fighters. Once hooked they can challenge even the most seasoned anglers with deep high speed runs and stubborn pin wheel rotations on the way up from the depths. Anglers should take short pumps on the rod and keep a constant pressure on the fish at all times while reeling it in. Yellow fin Tuna are excellent eating fish and can be prepared several ways. Sushi, Sashimi and Cevechi are probably the best ways to prepare Tuna. 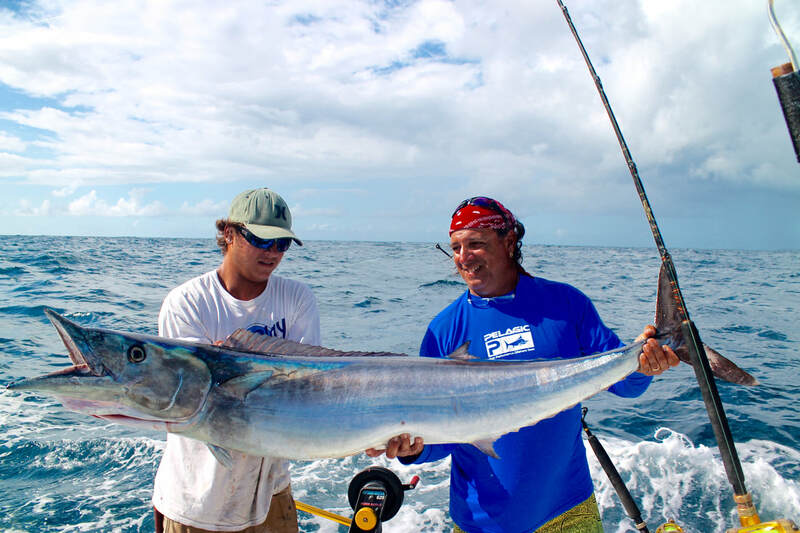 Wahoo can reach sizes exceeding 100 pounds in Tobago's waters. They are fast swimming fish that often fool anglers into thinking that they have hooked a Marlin, They are a common offshore specie that travel in shoals. Multiple catches are common. Aboard Hard Play we have recorded as many as 77 Wahoo caught in an 8 hour fishing trip. An excellent eating fish and a favorite on the Grill. For best results slice thin, marinade and grill for 90 to 120 seconds on each side. Island record 103 pounds. Dolphin fish is the most abundant off shore gamefish that are found in these waters. They travel mostly in shoals of 5 to 15 fish but can be found around floatsum and FAD's in huge numbers. When Mahi are in feeding mode, fishing action can be fast and furious. Multiple hook ups with high leaping Mahi that put up quite a challenging battle for the angler. The big males also known as the "Bulls" are very stubborn to get to the boat . Another top eating fish that is great on the grill and for cevechi. Island record 63.12 pounds.